Strain onto tray covered with greaseproof paper. Mix together all other ingredients and add to cocoa mass mixture. Mix together chocolate speculoos and praliné. Pour onto praliné mixture and homogenise. Mix together all Purees and vanilla. Add sugar and pectin, and heat to 65°C. Mix well and leave to rest in freezer until moment of use. Boil together all purees. Add vanilla and leave to infuse. Blanch together sugar, egg yolks and starch. Remove vanilla from boiling fruit purees and pour latter onto blanched mixture. Cook cream for 2 minutes, and add butter and pre-hydrated gelatine leaves. Leave to cool on film-wrapped tray. When cool, whip up, mix in whipped cream and store in cold environment (4°C) until moment of use. Bring milk to a boil and pour onto blanched mixture. Cook cream for 2 minutes, and add hydrated gelatine leaves and chocolate. Whip up, mix in whipped cream and store in cold environment (4°C) until moment of use. When cool, cut chocolate biscuit into desired shape and place into equally sized frame. Spread crunchy chocolate speculoos praliné onto chocolate biscuit and freeze. 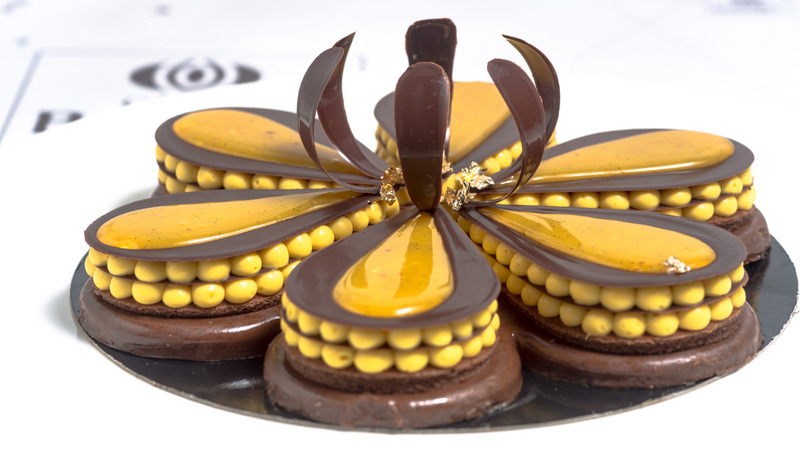 Unmould, pipe passion fruit mango diplomat crème around biscuit edges with small piping bag and pipe chocolate diplomat onto biscuit centre. Cover with thin layer of Cacao Barry® dark chocolate couverture Extra-Bitter Guayaquil 64% cocoa and repeat piping steps. Cover with thin, ‘open-worked’ layer of Cacao Barry® dark chocolate couverture Extra-Bitter Guayaquil 64% cocoa and pipe ‘4 flowers’ compote into the centre.